Thirsty Pilgrim: More Ruminations on Midwestern Style, Such As It Is. More Ruminations on Midwestern Style, Such As It Is. 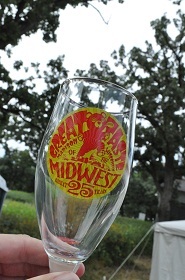 I went to the 25th annual Great Taste of the Midwest last August searching for "somewhereness" in the beers there. I'm a Midwesterner myself, originally, and I wanted to know if there was anything that sets the region's beers and brewers apart from the rest of the world. Part of that search resulted in an article in the latest All About Beer magazine, including some fun stuff from New Glarus co-owner and brewmaster Dan Carey. The article's not on the website so look for it wherever the finest magazines are sold. Or subscribe here. Like most kids growing up, I didn't think my hometown or even my region had any culture to speak of. But, as often happens, I moved away and looked back. Then I saw it pretty clearly. Tom Griffin is another Midwesterner with perspective. He lives in Madison and is a longtime member of the Madison Homebrewers and Tasters Guild, which organizes the Great Taste. But he's originally from Florida and recently has become known as the “Barrel Guy” (more on that story here). Griffin has traveled tens of thousands of miles selling used whiskey barrels to brewers, facilitating the barrel-aging phenomenon almost single-handedly. If you've tasted a barrel-aged beer from any brewery around the country, there's a pretty good chance that Griffin sold them the barrel. For his part, Griffin says the secret to Midwestern beers may lie in the friendly, open communication among brewers. He said he's seen plenty of that same cooperative spirit on the West Coast—and noted that many of those brewers, including Firestone Walker's Matt Brynildson, are originally from the Midwest. And what about Fritz Maytag, often thanked for fathering modern craft beer when he revived Anchor in San Francisco? Yep. He's from Iowa. What story do the beers tell? To be fair, not all of what I tasted that fine Saturday at the Great Taste could described as "balanced." However, trying to go for a mix of the weird and not-so-weird, I found that the most impressive beers were indeed on the “everyday” end of the spectrum. I tasted several excellent, flavorful lagers loaded with grainy, hoppy, country character. I tasted a series of session-strength pale ales with big hop aromas but nonetheless subdued bitterness—a bitterness that nods and says “howdy” but doesn't caulk your tongue with resin. One of my favorite examples that day: a crisp, aromatic pale ale from Dave's Brewfarm that weighed in at 3.7% alcohol. Its name: Imperial Double. So maybe there's also something to be said, as well, for the Midwestern sense of humor. So I hunted Glazer down at the Great Taste and got some more out of him. "While it might be great to have a sour beer, an IPA, whatever, we're really looking for something we can buy a 12-pack of, or the case that we can keep in the garage," he said. "We throw that in the garage, and that's what we drink. "What we're really looking for something that we can drink every single day, because that's when we're doing to drink it." So is there anything to this? Does Midwestern beer find its sense of style in the balanced, in the drinkable? There is plenty of anecdotal evidence, for whatever that's worth. As I mentioned in the article, the region's top craft sellers include beers like Boulevard Unfiltered Wheat, Goose Island Honker's Ale and New Glarus Spotted Cow. Another anecdotal example, off the top of my head: Steve Crider of 2nd Shift in New Haven, Mo., is a wizard with hops and his IPAs are among the best I've smelled and tasted. But his smooth Hibiscus Wit is the one that sells like mad. On the other hand: More than anywhere else, the West Coast has carved out a beer identity with its hop-forward IPAs—which many people I spoke to described as "unbalanced." Comparisons are inevitable; quite possibly, easterners and southerners would describe their own beers as "balanced" and "drinkable" in comparison. In thinking about the beers I tasted that day, I can remember a few that I thought had some "sense of place" without even checking my notes. There was the Moon Man No-Coast Pale Ale from New Glarus, for its balance and its name. (On the other hand, it is difficult to avoid thoughts of terroir with the brewery that advises us to "drink indigenous.") The Founders All-Day IPA hit a similar sweet spot. There was the Hopfenstange Pils from Delafield Brewhaus, one of many grainy and well-hopped lagers at the festival. Lots of potential in that vein. Painting with broad strokes: Clean beers, pale, in which the bitterness is restrained so that one can taste the grains, but with the hops often making a comeback in the flavor and aroma. They are, in short, the sorts of beers that I especially like to drink. Which proves absolutely nothing, except that I'm looking forward to more field testing when I go home this summer, and every time I go home.